EPIDEMIOLOGY AND SOCIAL BURDEN OF THE FEMORAL NECK FRACTURES. The incidence of femoral neck fractures, one of the most common traumatic injuries in the elderly increases continuously due to the ageing of population on the planet and urbanization. In terms of global economic instability, increasingly more funds would have to be paid by the health systems for treatment of those fractures. Probably it will be necessary to revise and optimize some current therapeutic standards. Filipov O. Epidemiology and social burden of the femoral neck fractures. J of IMAB. 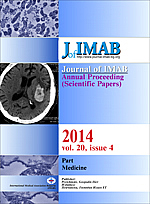 2014 Jul-Sep;20(4):516-518. doi: http://dx.doi.org/10.5272/jimab.2014204.516.